On October 14, 2017 in Houston Texas, Centric Design Studio (CDS) was presented with two design awards, during the 45th Annual National Organization of Minority Architect's (NOMA) Professional Design Awards of the National Exposition. These two awards meant a lot to CDS Partners, Saundra Little, AIA and Damon Thomas, LEED AP whose corporate vision is not only to design buildings, but also to design more equitable, economically viable, and sustainable cities. Little, and Thomas were honored to receive a design award in the Historic Preservation Restoration & Renovation Category for their work on Techtown Detroit's First Floor Renovation. There was much competition for this $1.5 million, 20,000 square-foot first floor renovation project. 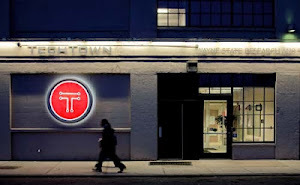 The TechTown building originally designed by renowned architect, Albert Kahn in 1927, is now the longest operating business innovation hub, helping entrepreneurs in all stages of development to connect with the right resources, at the right time. The pair were equally as honored as they took the stage to receive a second Design Excellence award in NOMA's first ever Small Project category for their work on the David Klein Art Gallery. 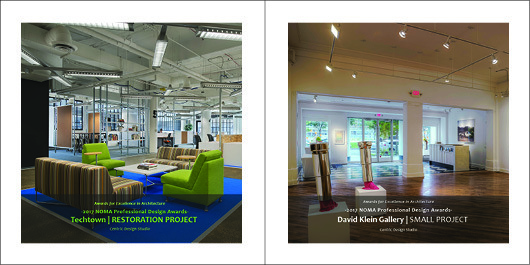 The redesign of the David Klein Gallery, was also featured in a book by Michael Arnaud titled, Detroit The Dream is Now, a photographic journal about "The Design, Art, And Resurgence of An American City," reminiscent of the gallery owner's, dream of bringing a national presence to Detroit's design community, when Centric Design Studio was hired to design and adapt this space for his second art gallery in the burgeoning downtown area of Detroit, MI. When it comes to adapting older urban buildings for new purposes Centric Design Studio has found a perfect balance for planning and designing spaces that allow natural lighting to flow through. While honoring the integrity of the original structure and design, they add new energy efficiency technology enhancing the building's beauty and functionality. About the National Organization of Minority Architects, (NOMA): NOMA is headquartered in Washington, D.C. NOMA consists of volunteer members who contribute their time and resources to champion diversity within the design professions by promoting the excellence, community engagement, and professional development of its members.